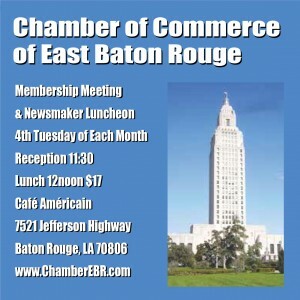 BATON ROUGE — Small business owners, guests, and members of the meeting are invited to attend the monthly meeting of the Chamber of Commerce of East Baton Rouge at Café Américain, 7521 Jefferson Hwy. in Baton Rouge. The reception begins at 11:30 a.m. and lunch begins at 12 noon. Adjournment is 1;05 p.m.
Chamber EBR meetings always feature a public official or other newsmaker speaking on the most important events facing the parish, state, and nation. Lunch is $17, but lunch is complimentary for members of the working media. © 2019 Chamber of Commerce of East Baton Rouge. All Rights Reserved.